I feel slightly embarrassed in the sense that my personal experiences of running are pretty lame. 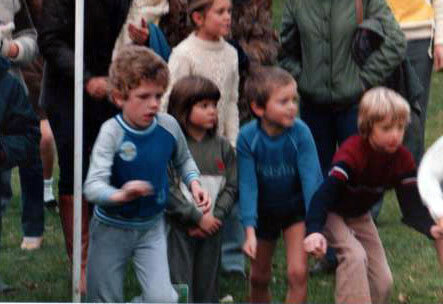 I once did the Menston four-mile fun run. I would have won the under seven category except for half-way around; I stopped to take my number off my front and put it on my back (so it wouldn’t flap in my face). I got pipped on the line and finished 2nd. It was an early lesson in marginal gains. Put your number on properly. 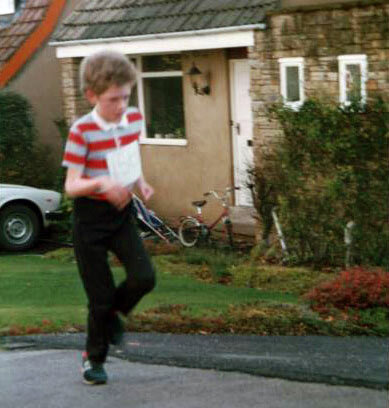 Aged 14, I ran for my school – Bradford Grammar School. In those days, I doubt very much I was meditating on the spiritual significance of running – rather cross-country seemed a less bad choice than having to play rugby. Once I came last in a race, so I used this as an excuse to give up cross-country running and take up being a teenager instead. When I joined Sri Chinmoy’s Path, I took up running for a short while. It was great for a few months, but then I got a knee injury for a few years, so I took up cycling instead. Having related my lame-running stories, it is fair to say there is considerable overlap with being a cyclist. Anyway, one thing worth mentioning in addition to this article. In the Sri Chinmoy Centre, I know a considerable number of people who have completed one or several marathons. Nothing too extraordinary, as it is more commonplace these days. But, I know quite a few of those who have completed marathons are outwardly quite unathletic in nature. At least, you would not guess they have a few completed marathons up their sleeves. I know that if they had never been inspired by Sri Chinmoy’s path, they would never have completed a half-marathon, let alone a full marathon. It is inspiring that where the will is willing, there is a way. This is an aspect of Sri Chinmoy’s path – we (and other people) are always much more capable than our mind would let us believe.